FRIDAY, Dec. 21, 2018 (American Heart Association) — Brooke Lennington’s phone buzzed late one night in 2016, a week before Thanksgiving. Her younger brother, Hunter, was calling, frantically saying a nurse at a hospital had called about their father. Hunter, a teenager, had been too overwhelmed to learn more. Brooke called and learned that then-50-year-old Rich Lennington had suffered a stroke. She asked how serious it was. Rich had suffered a massive hemorrhagic stroke, which means a weakened blood vessel in the brain ruptured. This leads to blood accumulating and compressing the surrounding brain tissue. Only about 13 percent of strokes are hemorrhagic. Rich had been alone in his apartment in Goodland, Kansas, when it happened. Emergency responders estimated that nearly seven hours had passed before he called 911. The longer the wait, the higher the potential for long-term damage. Rich was flown to a stroke center in Colorado. Brooke and Hunter drove through the night from Kansas. “We didn’t know if he’d be dead already or if we’d be there to say goodbye,” she said. Adding to the swirl of emotions: Brooke had only reconnected with her dad a few years before. Rich had been abusive and an alcoholic, Brooke said. She was 9 when her parents divorced. She had very little contact with him for many years. 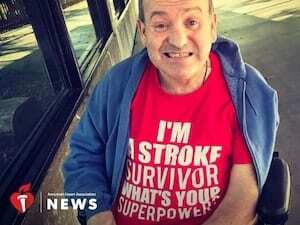 But they reconnected three years before his stroke — when Rich was recovering from a heart attack. On the drive to Colorado, Brooke received a call from surgeons seeking permission to drill a hole into her father’s head to release the pressure from the bleeding. She said yes. When Brooke and her brother arrived the next morning, they found Rich on a ventilator with his left side paralyzed and unable to speak. Doctors predicted he would die within three months, six at the most. Rich hadn’t been taking his medication for high blood pressure, which is a leading cause of stroke. He’d continued drinking, too. After a couple of days, doctors discussed taking Rich off the ventilator, but Brooke couldn’t bring herself to make that decision. So, they decided to momentarily see what would happen without it. He surprised everyone by breathing on his own. A week later, he was alert and talking. Rich now lives in a nursing home near Kansas City. He remains paralyzed on his left side and uses a wheelchair. But he can talk and eat. Both father and daughter have struggled — Rich because of his inability to live independently and Brooke because her life is consumed with caretaking, although she’s learning to take care of herself, too. Another struggle was trying to find time to spend with her boyfriend, Jarod Marcotte, who praises her for shouldering such a huge, unexpected burden. “I really saw Brooke’s strength and independence,” he said. Brooke’s turning point from anger to acceptance came a year after the stroke, when she and Rich attended Retreat & Refresh Stroke Camp, a nonprofit that gives stroke survivors and caretakers a chance to have down time and even some fun. She attended both as a participant and to do a segment for her news station. She’s now in touch with fellow caretakers, which has been a huge support. Brooke said she also had to overcome a sense of discomfort and vulnerability about having a seriously disabled father. Airing the story about the stroke camp was the first step. More significant was a feature about her father, the final report in the series. It received a huge response from viewers, and strangers still stop her on the street to ask about her dad’s health.